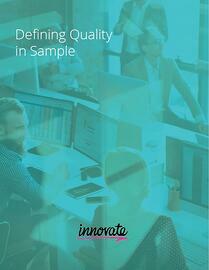 What Defines and Maintains Quality in Sample? Data quality issues have proliferated throughout the industry, with increased incidences of fraud, straight lining, the initiation of a portable experience, and the increased need of clients to see results in just a matter of days or even hours. What steps can and should a sample provider take to ensure the integrity of their sample, while combatting potential fraud and dips in quality? What you should look for when preparing your next survey.